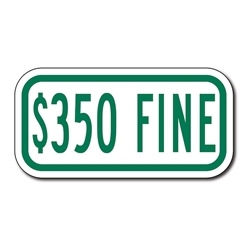 Display this $350 FINE Sign below the R7-8 Federal Reserved Handicap Parking sign to meet handicapped parking requirements for Illinois and other states. Please check with your local authorities. DOUBLE the working life of your Handicap Parking $250 Fine Signs by adding 3M Protective Overlay Film (POF)! 3M’s high-tech POF protects sign faces against fading caused by the sun and harsh weather—and makes graffiti and sticker defacement damage easy to clear away without harsh abrasives.